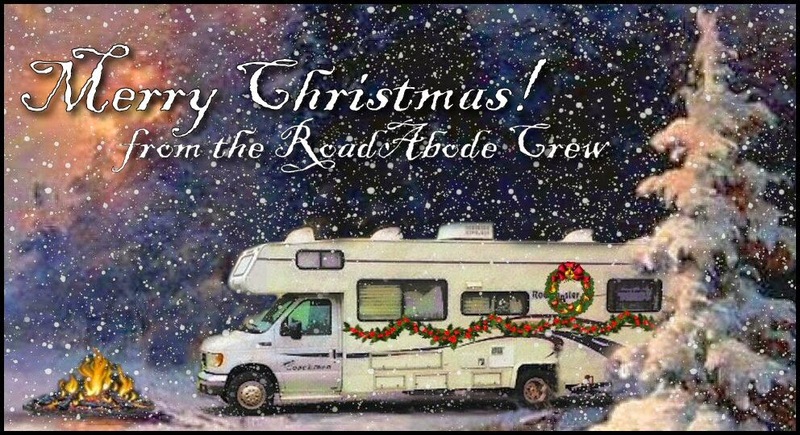 The Adventures & Travels of RoadAbode: Merry Christmas & Happy New Year from the RoadAbode Crew! Merry Christmas & Happy New Year from the RoadAbode Crew! Though RoadAbode is tucked all snug in her bed, with her Crew dreaming of our next destination in our heads, we wanted to wish you all a Christmas and Holidays full with glee, and a New Year with plenty of cool travels in your own RV! This time of year we dream of where we'll be going as a family, but also how we will be travelling once our girls are done with school and out of the nest. So We'll leave you this week with the lyrics I thought up to the tune of :"Winter Wonderland" Peace and Joy to you this season! Palm trees sway, can you see ‘em? Dreaming of Snowbirding is so Grand!. Dreaming of Snowbirding is so Grand! And we won't have to wear our winter clothes.